If you like the idea of tattoos on the weekend and none during the week then temporary tattoo stencils are for you! If you have plans to attend a special event and want to showoff a special image but not have it permanently attached try Body Stencils (click here for more info on how to use these stencils). Maybe you would rather have a different picture every weekend. How fun would that be. No problem. 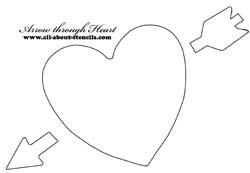 Here are a couple of stencils that you can use as temporary tattoo stencils. Here is one of the favorites from the Valentine Stencils Collection. The heart with an arrow through it is a common tattoo design. After printing any of these stencils cover the top of the page with a clear coating like clear shelf liner before you cut out the openings. that way you’ll have them to use again and again. After using them you can wipe off the paint with a damp cloth and store in a book for future use. 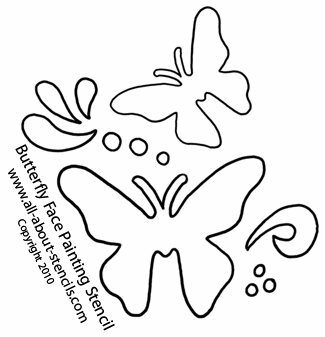 These Butterflies are from the Stencils for Face Painting Collection. You’ll find many free stencils on this site that are very useful as temporary tattoo stencils. An easier way to apply the image to the skin with a stencil is to print onto a full sheet of label of sticky back paper. Cut out the stencil design and then peel and stick. The sticky paper will hug the skin better and prevent paint from seeping under and smearing your image. Always, always test whatever you are using to make sure you will not have a reaction to the sticky paper or the paints that you are using. Make sure to use paints that are made for use on the skin. Never put anything close to the eyes and this should always be done under the supervision of an adult. 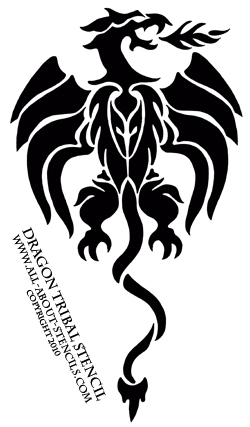 This dragon comes from the Tribal Stencils Collection. There you’ll also find another cool butterfly. Hey! Don’t forget that I (and everyone else) want to see what you have done with your temporary tattoo stencils. Just click on Stenciling Projects to get your masterpiece showcased here on this web site. Won’t that be exciting! Or if you have any questions or want to share information join in on the Stencil Blog. Well, I hope to hear from you soon. Return to Home Page from Temporary Tattoo Stencils. Return to Body Stencils from Temporary Tattoo Stencils.